Before sending a job to a 3D printer, the model to be printed needs to be tessellated. That means that its geometry needs to be converted into triangles, which are used by the printer to create layers. It is very important to pay attention to this step: if not done correctly, it can cause problems such as inaccuracy or slow processing. Standard formats in the additive manufacturing industry include 3MF (with more information about the model) and STL. A normal file size for a model is about 1–30 MB, but the size depends on the type of software that created it, the number of triangles, the number and level of details, and so on. When exporting to STL in a CAD package, you are often required to introduce some parameters such as angle tolerance and deviation chord height. 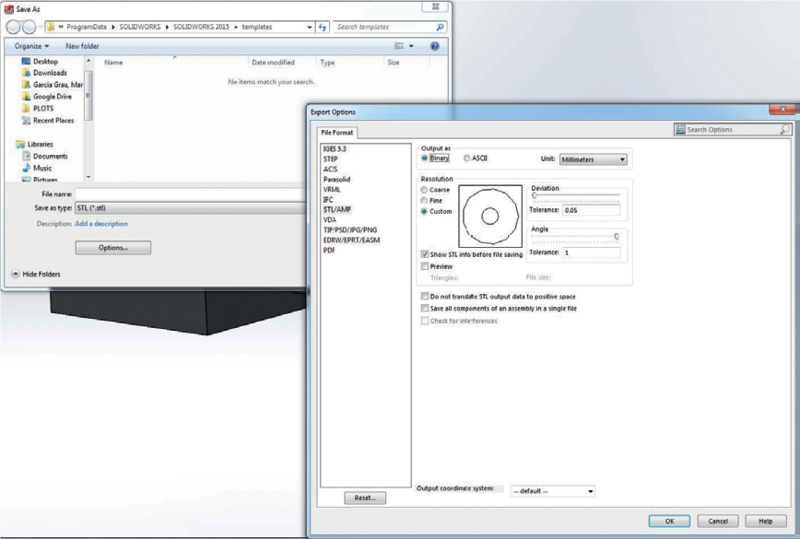 These parameters define the resolution and file size of the part. The following tips may help you to export with the best surface to file size ratio. Save as STL, click Options, and check the ASCII option. The recommended values for the Distance and Angle box are 0.05 and 1. Select STL (*.stl) as the file type. Choose the Binary option. Binary files are smaller than ASCII files for the same tessellation. Set the deviation tolerance to 0.05 mm. 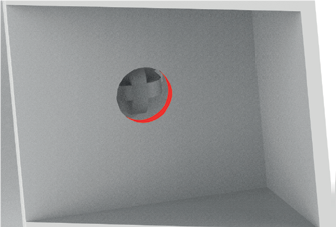 Set the angle tolerance to 1°. Click File Name > Save. Select Detail Controls from the Mesh Options. 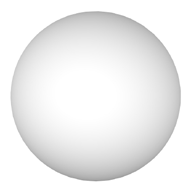 Set the maximum angle to 1, the maximum aspect ratio to 6, and the minimum edge length to 0.05. Too many triangles are difficult to process and, when a certain size is reached, the extra triangles do not provide any further accuracy. For this reason, an excess of triangles could increase processing time for no benefit. 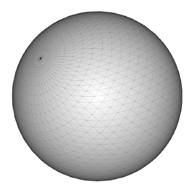 Triangulation of a surface causes faceting of the 3D model. The parameters used to output an STL model affect how much faceting occurs. Multi Jet Fusion technology allows you to print letters and drawings with a very high resolution and definition. For the best possible output, any text, number, or drawing included in a part is recommended to have at least 1 mm of depth or height. 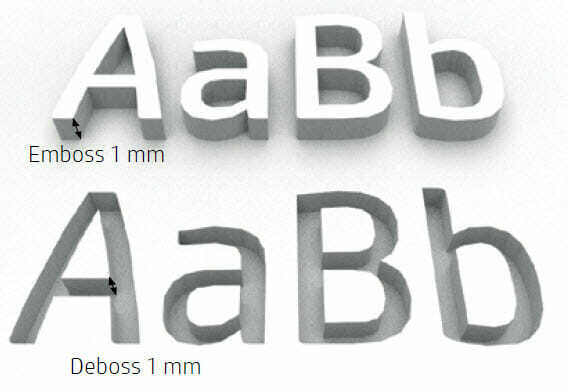 The best orientation for embossing letters is to place them upside down in the build chamber, while for debossing letters it is better to place them face up to achieve the best resolution. Can be achieved by HP Jet Fusion 3D is ±0.2 mm up to 100 mm and 0.2% above that value, measured after sand blasting. Multi Jet Fusion allows you to print topology-optimized, generative designs or even small lattice structures. This kind of design helps to reduce the weight of the part and the quantity of material used, which not only reduces the cost of the part but also helps to reduce the operating cost in applications that are very weight-sensitive. 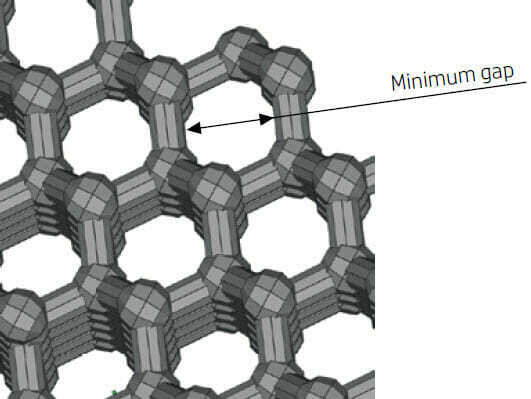 The minimum gap recommended in a lattice structure to ensure that all the material inside the part can be removed is 1 mm. When printing a cantilever, the minimum wall thickness depends on the aspect ratio, which is the length divided by the width. For a cantilever with a width less than 1 mm, the aspect ratio should be less than 1. There are no specific recommendations for widths greater than 1 mm. 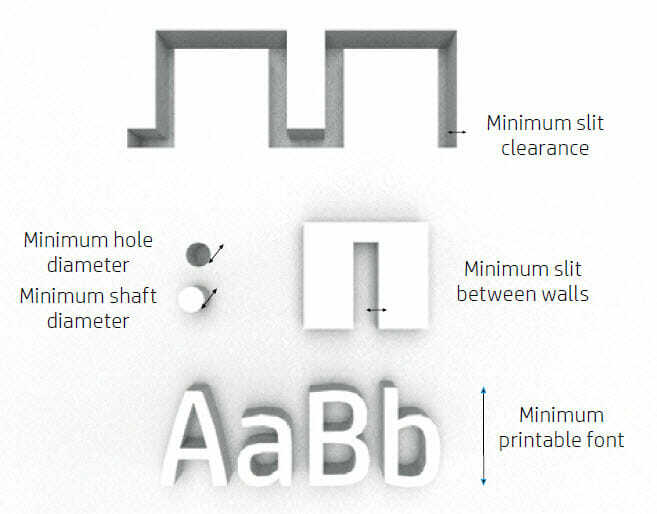 In general, the minimum recommended wall thickness is 0.3 mm for short walls oriented in the XY plane, and 0.4 mm for short walls oriented in the Z plane. For parts with a high aspect ratio, you are recommended to increase the wall thickness, or add ribs or fillets to reinforce the part. Very thick walls can accumulate heat and cause spot shrinkage in dense areas with an accumulation of material. Minimum gap between parts to be assembled after printing. Sometimes a pair of printed parts need to fit together for the final application. In these cases, you are recommended to have gaps of at least 0.4 mm (±0.2 mm of tolerance of each part) between the interface areas that should fit together, in order to ensure correct assembly. Minimum spacing and clearance between parts printed as assemblies. 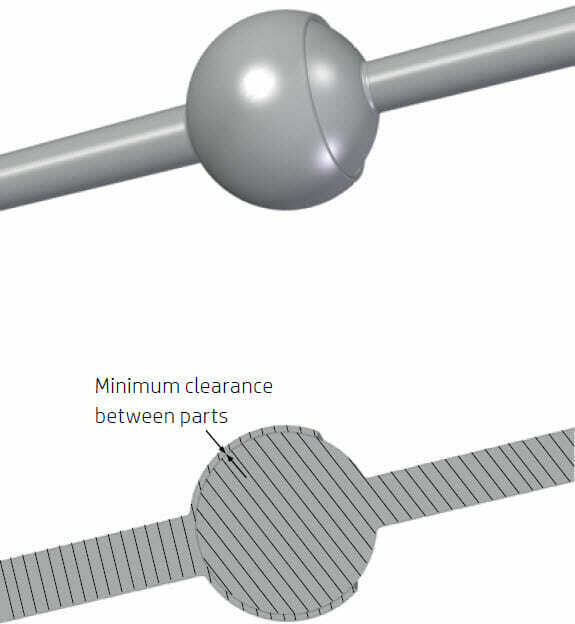 Assembly parts that are printed together should have a minimum clearance of 0.7 mm. 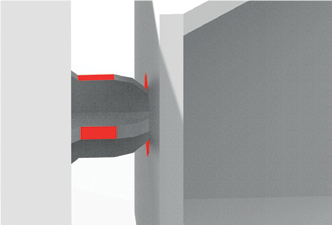 Parts with very thick walls above 50 mm should have a higher gap in order to ensure proper performance. Multi Jet Fusion is a process in which the parts are built by selectively fusing the desired areas of a material-based layer. If the parts printed are hollow, drain holes need to be added to the design to remove the material. The minimum recommended diameter of the holes is 2 mm. You are recommended to include at least two holes. Parts larger than the maximum build size can be printed with Multi Jet Fusion by splitting them into different parts. They can then be joined together by gluing, welding, or by pin inserts. If you plan to glue parts together, you are recommended to include interlocking features such as those shown in the pictures below: as a guide to position the parts, to help them to bond together, and to facilitate the gluing process. Remember to leave an additional space of 0.1–0.2 mm between parts for the glue, in addition to the minimum spacing between parts printed as assemblies (see above). 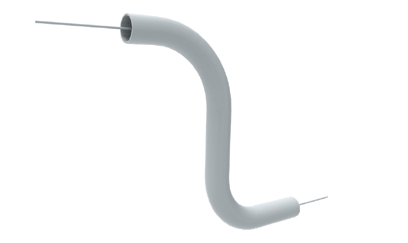 To remove material from narrow ducts, consider designing and printing a strip or a chain through the duct. When the parts have been printed, you can pull out the chain to dislodge most of the material. Any remaining material can be removed by the normal cleaning process. Still have questions this HP Multi-Jet part design guide did not answer or want to have us look over your part and make design suggestions?